My son wearing the costume. My 3 year old son loves the movie, "Box Trolls." 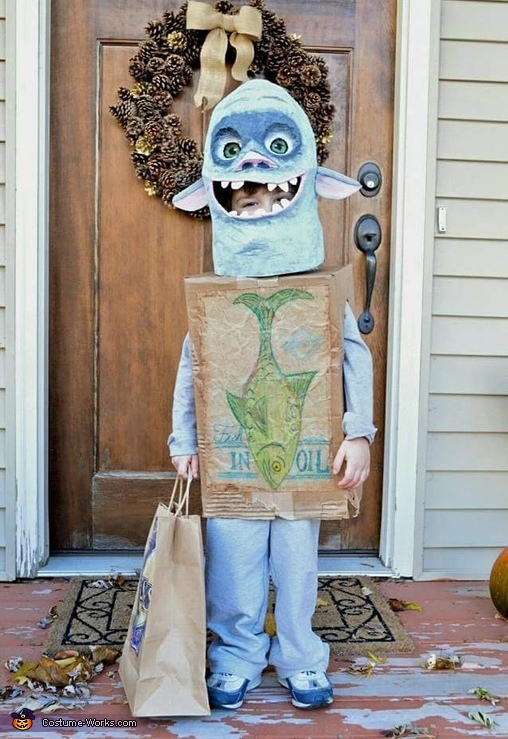 He wanted to be the character, Fish for Halloween. I love a challenge! I paper mache the mask using an oversize skull, molding clay and a balloon. I used a thick flour and water recipe with newspaper strips. I grabbed a box lying around the house for the body and drew the label on a paper bag. I printed the "eggs" label and glued that on a brown gift bag(for his trick or treat bag). He loved his costume and was so excited to be a box troll! Can you give me more details and instruction on how you made the head? My son, who is also 3, saw this picture and told me "mom you need to make me like this" I always go all out for him on Halloween and want to make this happen for him!! Please and thanks! Just like the comment above! I have a 4 year old who is totally obsessed with the Boxtrolls! when he saw this he was blown away(as was I)! do you have further instructions on how to construct the face? I did a similar head using a mixture lastyear (jack skellington) so i did it on a balloon. If you could give me a little info I would be ecstatic! thanks a bunch! Same as the above comments! Would love more details on how you made the mask! It has been a while since I made this costume. I bought a big skull at Target molded the facial features with clay onto the skull(made sure to keep mouth open for my son to look out). Coated the clay with Vaseline(easier for mask to take off once dry)shaped the top of head with a balloon. I paper mached the skull, and painted it. Sorry, I hope that helps.